Hermann is not directly on the Katy Trail, but it is less than 3 miles from the trail and a popular destination due to its charm and character. This German-flavored town has numerous wineries, B&B's, antique shops, and other attractions. And it hosts a fantastic Oktoberfest the first four weekends in October (look below for a full listing of Hermann Festivals). Explore Hermann's German heritage at the Deutschheim State Historic Site. Amtrak's cross-Missouri route stops at Hermann, as well as a handful of other towns along the Katy Trail. Bikes are allowed on this route, if arranged in advance. 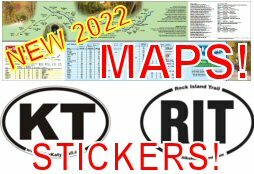 See the Katy Trail Amtrak Guide for full details. You can ride to Hermann via a bike-friendly and pedestrian-friendly bridge, with great views of the river. 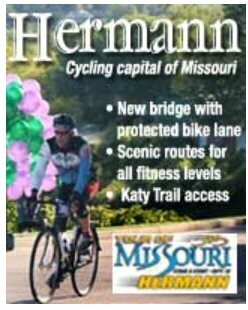 On the western side of McKittrick, you'll see the side trail to Hermann coming off of the Katy Trail - just west of where you pass under highway 19. Most of the side trail to Hermann is on a dedicated trail, although a section is along a wide shoulder of the highway. Total distance from McKittrick to Hermann is less than three miles. For those who prefer not to ride off-trail, some of the local B&B's will give their guests a ride between Hermann and the McKittrick trailhead.